In last week’s ComRes Pollwatch it was highlighted how, despite economic confidence returning to Britain, optimism varies significantly according to social grade. But there is one other big demographic divide which currently receives much attention too: the generation gap. 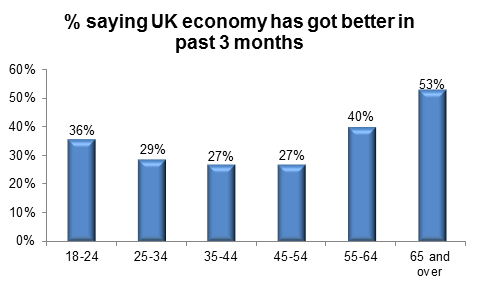 This does not tend to be so much one of optimism: younger people and older people tend to be the most confident in the belief that the economy is getting better, with middle-aged people less optimistic. But there are large differences between ages when it comes to both opinions of political parties and to political priorities. In a poll for the Independent on Sunday and Sunday Mirror at the end of last year, we revealed that people aged 18-34 were more likely to expect taxes be higher under a Conservative Government (34%) than a Labour Government (18%). In their lifetimes, it has been the Tories who have put up taxes that have affected them, such as VAT. Older people, such as the over-65s, who have memories of the 1970s expect to pay more tax under Mr Miliband’s party (45%) than Mr Cameron’s (23%). This divide has also been reinforced by the language used by the parties themselves. Younger people aged 18-34 (33%) are nearly twice as likely as people aged 65 and over (18%) to say that the biggest priority for the next Government should be “ensuring that wages rise faster than prices” – a phrase much-used by Labour. However, this does perhaps show the limitations of the party’s messaging. Although a quarter of people aged 65 and over (25%) say keeping inflation down should be the next Government’s top priority, suggesting they do feel one part of the “squeeze", the focus on “wages rising faster than prices” does not directly appeal to them, when most are retired. 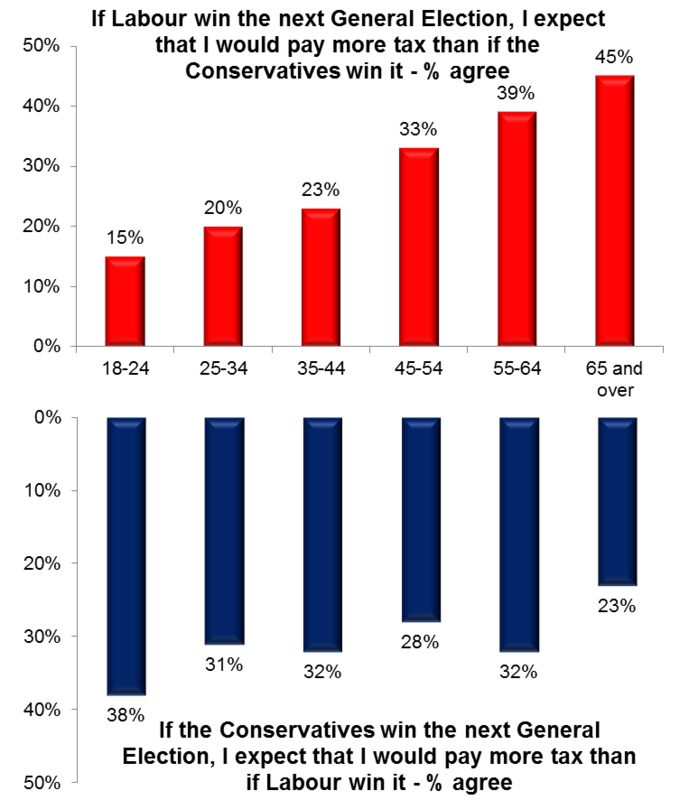 This may contribute to why over-65s are the only age group to have more people currently saying they would vote Conservative (35%) than Labour (26%). Most readers will no doubt be thinking this all represents Advantage Conservatives. Older people are whom you want on your side come election-time: there are more of them and they are much more likely to vote than their younger counterparts. The parties know this themselves too. George Osborne could not have been less coy about it last week when he guaranteed pension rises at the same time as re-announcing that he would cut housing benefit for all under-24 year olds. This obviously presents Ed Miliband’s Party with quite a problem. There is some debate about whether people vote for themselves (“egotropic voting”, as it is sometimes called) or whether they vote with a social conscience (“sociotropic voting”). However, the consensus generally comes down on the side that, at election-time, people’s own interests tend to win out. This would suggest that Labour either needs to get younger people out to vote in unprecedented numbers for recent times, or to find something to offer older people directly. But Ed Miliband has done neither so far. He seems to have calculated that there is one group of people that Britons will put before themselves. In the 1990s, when Tony Blair promised to make his top three priorities “Education, Education, Education”, he appealed not to voters concerned for themselves, but to the millions of baby boomers who had children of, or approaching, school age and who were concerned the futures of their families. It is easy to see why. The numbers speak for themselves. 89% of Britons with adult children say that there is too little housing that people can afford, while a quarter (27%) have at least one child aged 21-40 living at home. Even amongst those with children living away from home, half (50%) contribute to their children financially – at an average of more than £160 per month. A quarter (23%) say that this has caused them stress. In total, one in six (17%) people aged 65 and over say that they have given “large, regular payments” to an adult child. For this reason, we should not be surprised if Mr Miliband’s big speech tomorrow contains plenty of references to “our children” and “future generations”. He is very possibly trying to pull a rabbit out of the New Labour hat.